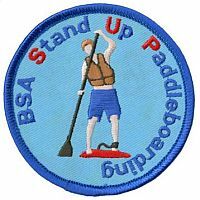 The stand-up paddleboarding (SUP) emblem is designed to encourage Scouts to develop paddling skills that promote fitness and safe aquatics recreation. The 3" round emblem features a stand-up paddleboarder against a bright blue twill background, and is worn as a temporary patch.. Describe the correct appropriate type of leash to wear in the appropriate different water venues.